As the 164th Engineer Combat Battalion battled its way through Europe during 1944 and 1945, Claude Musgrove served as the unit’s photographer. 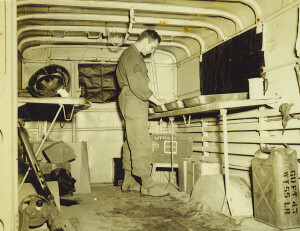 He converted a captured German ambulance into a mobile dark room and made an enlarger using a condenser lens from a movie theater. Along the way, he photographed history in the making. His unit was among the first to enter Germany, crossing the famous Ludendorff Bridge at Remagen. Hitler’s army had failed to destroy the bridge as they were retreating, so 8000 troops of the 9th Armored Division crossed it within 24 hours after capturing it. Claude’s battalion was put in charge of defending the bridge. 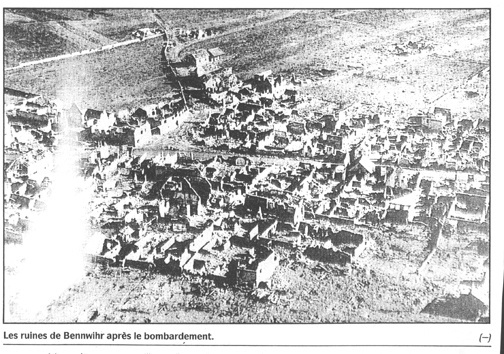 The Germans threw everything they could at it – bombs, artillery, even frogmen who swam down the Rhine to blow it up. They failed initially, but managed to damage it severely. “The major in charge of the bridge told the Stars and Stripes that after ten days’ work it was stronger than it ever was. The next day it collapsed and killed him and twenty-three engineers,” Claude said. 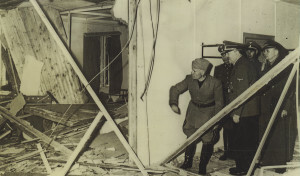 Claude did his best to preserve historical photographs he found in German government buildings. He found more than 500 photographs taken by Heinrich Hoffmann, Hitler’s personal photographer. 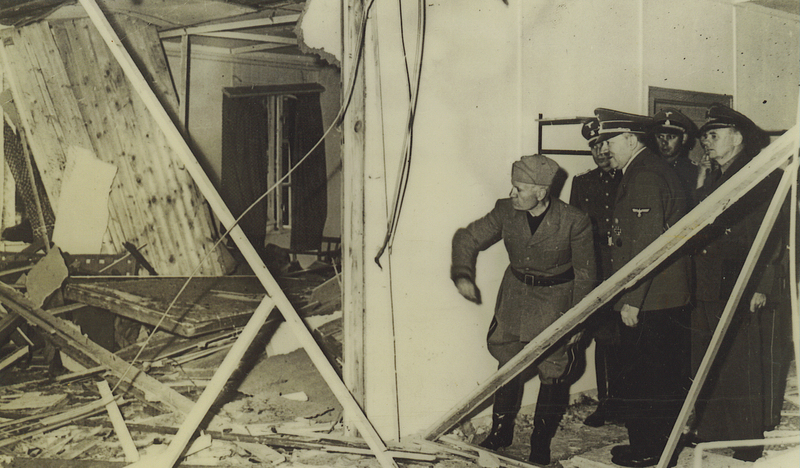 One shows Hitler and Mussolini inspecting a room destroyed by a bomb in the failed assassination attempt of July 20, 1944. Another photo triggered a personal memory for Claude. It shows Herman Goering, head of the German Luftwaffe, with Colonel Ernst Udet, the number two ace in World War I, after the Red Baron (Manfred von Richthofen). Claude also had two books that each include a viewing apparatus and 100 stereoscopic photographs of Germany and the war. Another book on the history of the Nazis had actual glued-in photographs instead of pictures printed on the pages. Claude returned to work at Westinghouse. After he retired in 1969, he and his wife Evelyn bought a motel in Clearwater, Florida, which they operated for nine years. After that, they spent winters in Florida and summers in Fredonia. Their family grew to include 18 grandchildren and 21 great grandchildren. He bought his first computer when he was 88. He used it to digitize the many photographs he had taken and collected. 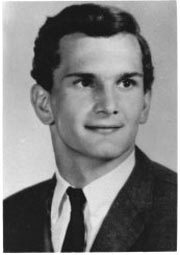 When you read the profiles of the men and women whose names appear on the Vietnam Memorial, you are overwhelmed with how young most of them were when they died – in their teens or early twenties. Not so with the heroes of the War on Terror. Sgt. 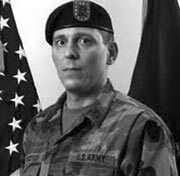 Daniel Brozovich, for example, was 42 years old when he died while on patrol in Ashraf, Iraq, on October 18, 2006. The army of the late ‘60s and early ‘70s was made up mostly of draftees and young people who enlisted to fight in Vietnam. When the war there ended, so did military conscription. The last men drafted reported for duty in June, 1973. So it was an all-volunteer army that fought in Iraq and Afghanistan. Many were career military reservists who were called to active duty. That again was the case for Sgt. Brozovich. When he and his twin brother, David, graduated from Bedford High School in 1982, Danny joined the Marines and David joined the Air Force. Four years later, Danny moved back to Pittsburgh to work for Alcoa. But he still believed in an obligation to serve his country, so he joined the National Guard. He married Mary June Stevens; they had a daughter, Carrie. Then he moved to Greenville to work at Werner Company. That’s where their second child, Ryan, was born. For a short time before his last deployment, he worked as a guard in state prisons, first in Fayette County and then in Findlay Township. During his military career, Sgt. Brozovich served a tour in Germany and two tours in Iraq. Daniel’s father, Anthony, admired the way Danny’s wife handled it all, calling her a rock who supported her husband and held the family together. 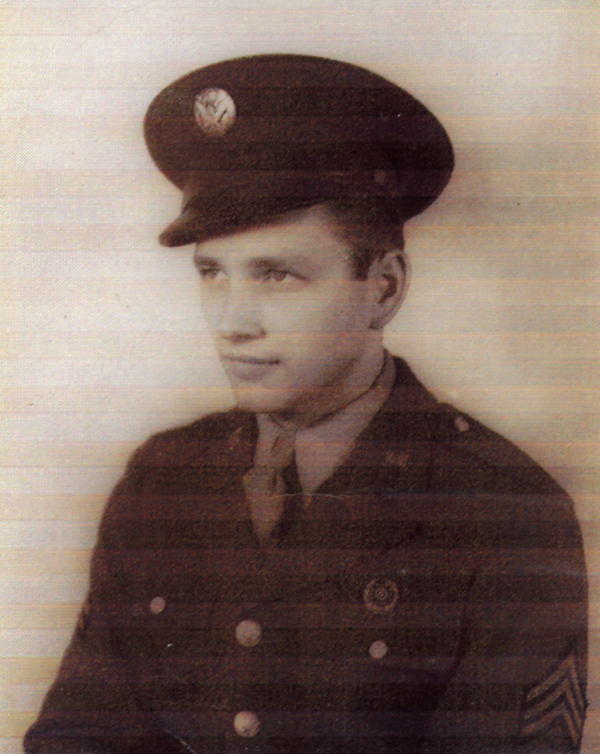 His final assignment was with the 107th Field Artillery Battalion in New Castle. “When he was military, he was all military,” said his mother, Beth. His compatriots in the army agreed with her. At the news conference in the National Guard Armory in New Castle announcing his death, Lt. Col. Grey Berrier II said Sgt. Brozovich was a charismatic leader who was “fully committed in word and deed to empowering the Iraqi people to pursue political and economic freedom. He was a man who “always led from the front.” Similar praise characterized his funeral service in Greenville. Sgt. Brozovich was well decorated with two Bronze Stars, Purple Heart, War on Terror Expeditionary Medal, Good Conduct Medal, Pennsylvania Meritorious Service Medal, Iraq Campaign Medal. 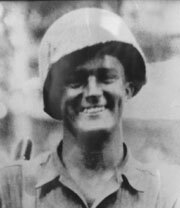 For Ed Kochis and his quartermaster unit in North Africa, the major threat to survival wasn’t enemy attack. It was meeting the ordinary needs of everyday life, such as food, water, and shelter. They had c-rations – at least, when the supply ships weren’t sunk. They had to scrounge food any way they could, and buy it from the locals. One staple was a hard bread that the Arabs soaked in wine. For a year and a half, the 76 men in his unit slept in pup tents. Each soldier had a shelter half, so two had to get together to make up a tent. Kochis and his tent mate were both over six feet tall. When it rained, they had to put their duffle bags outside to keep our feet dry. The unit’s living conditions improved after they moved to Italy, near Foggia. Some of his friends managed to “requisition” cots and some walled tents that could sleep five or six. The closest Kochis got to the front lines was about ten miles. 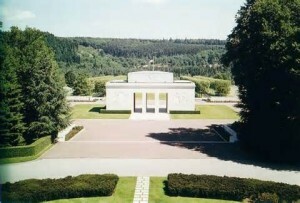 Doyle was a B-17 pilot stationed about ten miles from Kochis. They saw each other a couple of times a week for several months. Then he didn’t show up. He had been fatally shot down over Czechoslovakia. Kochis’s last few months in the army were nothing like his years overseas. As a PT instructor in Texas, he led calisthenics, played softball twice a day, and had the rest of the day off. Returning home in 1945, Kochis got a job at the Greenville Motor Club, which became the Mercer County Motor Club. He remained as head of that organization for 41 years. It’s impossible to understand the strength and courage that enables one to perform in such a way as to merit the Medal of Honor. You might get a glimpse of it by considering the actions of Greenville native Gus Kefurt. S/Sgt. 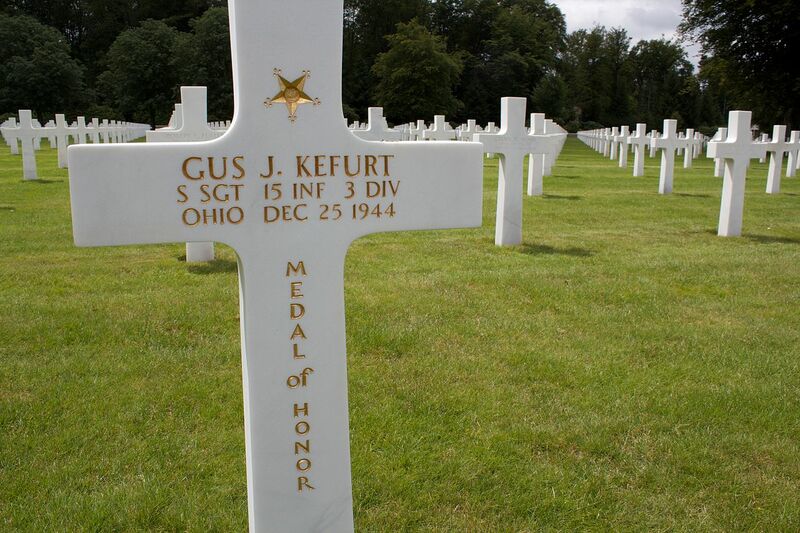 Kefurt was buried at the American Cemetery and Memorial in Épinal, France. Those who deny the Holocaust should talk with the children of Herbert S. Werner. As children, they saw many photographs their father sent home that showed the concentration camps liberated by the 12th Armored Division. 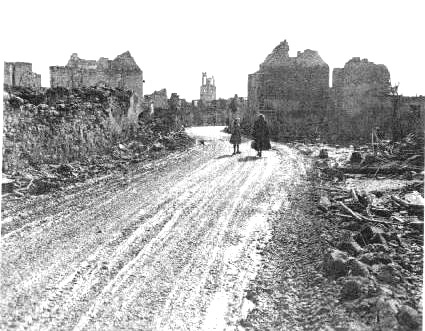 Assigned to the headquarters of the 12th Armored Division as its chief financial officer, Lt. Col. Werner was in a position to observe the Division’s accomplishments, including its legendary combat operations, the capture of Werner von Braun, and the liberation of twelve concentrations in the area of Dachau. He came to that position through a military career that started when he enlisted in the army in 1917. His first overseas deployment was with the Allied Expeditionary Force in France during World War I. Between the two world wars, he served as a captain in the Finance Corps of the army reserves. As things were heating up in Europe during 1939, Captain Werner was called to active duty to serve as chief financial officer at the Raritan Arsenal in Metuchen, New Jersey. 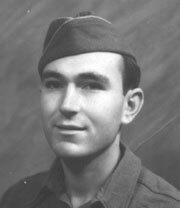 As the war progressed, the army sent him its Finance Officer Training School at Duke University before assigning him to the 12th Armored Division. That division entered the European Theater of Operations through Le Havre, France, on November 11, 1944. After fighting its way across France and through the Maginot Line, the 12th Armored Division became the “Mystery Division” of General Patton’s Third Army. To accomplish the invasion of Germany, General Patton assembled thirteen divisions, making it one of the largest American armies in history. The identities of twelve of them were known, while the thirteenth was kept secret to enhance the element of surprise. The identity of that division became known when it crossed the Rhine River on March 24, 1945. By the time the 12th Armored Division was departing Europe, Lt. Col. Werner was the oldest finance officer in Europe. Lt. Col. Werner’s daughter, Shirley, also served in Europe, as a switchboard operator in Paris. Once, when her father was in Paris working on a project for the 12th Armored Division, they were able to spend some time together. 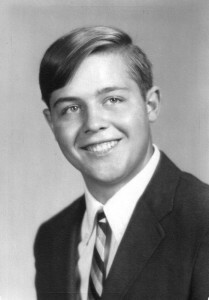 Nine months after graduating from Greenville High School in 1969, John Lopochonsky was drafted into the army. 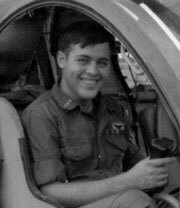 After training to be a helicopter door gunner, he headed to Vietnam in October, 1970 to serve with A Troop, 7th Squadron, 1st Cavalry. 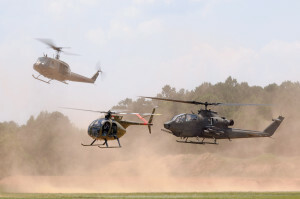 He was assigned as a gunner on an OH-6A “Cayuse” helicopter. That put awesome power at his fingertips, probably 7.62 mm six-barrel minigun, a Gatling-type weapon that could fire at the rate of more than 2000 rounds per minute. But to use that power, a gunner had to be both crazy and courageous. When teamed on a combat mission with a Cobra gunship, the Cayuse’s mission was to fly in low over suspected enemy positions to draw out their fire so the crew could mark their positions. Then the Cobra would come in with greater firepower and destroy them. In other words, the Cayuse helicopters were sometimes used like moving ducks in a carnival shooting gallery. But unlike those ducks which flop over when hit with a b-b, the Cayuse could take a lot of serious hits and still take its crew home safely. One of them accumulated 1,340 combat hours, was shot down four times, and had two non-combat accidents. It was repaired every time, and in the end returned to the United States where it performed well for the New York National Guard. Sgt. Lopochonsky was survived by his brother James, and his grandmother, Mildred Artman. 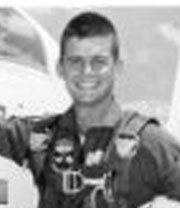 He was the 37th Mercer County serviceman to die in the Vietnam War.